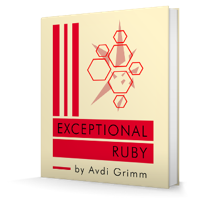 Exceptional Ruby is an in-depth guide to exceptions and failure handling in Ruby. Over 100 pages of content and dozens of working examples cover everything from the mechanics of how exceptions work to how to design a robust failure management architecture for your app or library. Whether you are a Ruby novice or a seasoned veteran, Exceptional Ruby will help you write cleaner, more resilient Ruby code. I also had a chance to talk with Avdi about the book for InfoQ, please give it a read. Readers can also receive a $3 discount off the already great price of $15, just go check out the interview to receive the discount.